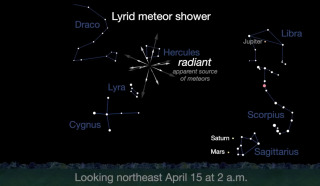 A graphic from NASA's Jet Propulsion Laboratory showing where in the sky the Lyrid meteor shower can be seen, until April 30. For enthusiastic meteor watchers, it has been a long stretch — nearly 16 weeks— since there has been a decent opportunity to catch sight of a reasonably good meteor shower. There are 10 displays during the year that are generally considered reliable and worth looking for, and the most recent of these, the Quadrantid meteors, peaked in early January. Since then, we've gone through the rest of winter and into the first full month of spring with not much in the way of significant meteor activity. That drought will come to an end this weekend for viewers in the Northern Hemisphere, with the appearance of one of the oldest known meteor showers. Vega will appear to rise from the northeast around 9 p.m. local daylight time, but by 4 a.m., it will have climbed to a point in the sky nearly overhead. You might want to lie down on a long lounge chair where you can get a good view of the sky, and be sure to give your eyes plenty of time to adjust to the dark. Bundle up, too, if you're somewhere where the weather's not yet summery; while it probably won't be as cold as on a winter evening, nights (and especially early mornings) in April can still be quite chilly in many areas. While hardly a rich display like the famous August Perseids or December Geminids, the April Lyrids are brilliant and appear to move fairly fast, appearing to streak through our atmosphere at 30 miles per second (50 kilometers per second). About 20 to 25 percent of these meteors leave persistent trains. Their orbit follows that of Comet Thatcher, which appeared in 1861 and has an orbital period of about 400 years. Earth's orbit nearly coincides with Comet Thatcher's around April 22 each year. When Earth passes that part of its orbit, we ram through the dusty debris left behind by the comet. Thus, the Lyrids are this comet's legacy; they represent the tiny bits and pieces shed by this comet on previous visits to the sun. None of us, of course, has any chance of seeing this comet's return engagement with the sun in the 2200s, but we will certainly be able to enjoy the sight of tiny bits and pieces that broke off its nucleus hundreds or thousands of years ago, blazing through our atmosphere in a fiery flash to create the effect of "shooting stars." The Lyrid meteor shower has been observed for more than 2,600 years; Chinese records say "stars fell like rain" in the shower of 687 B.C. Skywatchers have witnessed quite spectacular displays at least a dozen times since. On April 20, 1803, residents of Richmond, Virginia, after being roused out of bed by a fire bell, were surprised to see great numbers of meteors in all parts of the sky. In 1922, an unexpected Lyrid rate of 96 meteors per hour was recorded, and in 1982, rates unexpectedly reached 80 per hour. Although the Lyrids usually provide a weak display, they have a history of surprising observers — so it's always one to watch. One final note: While the moon will arrive at first-quarter phase on April 22, it will have set by 2 a.m. on Sunday, leaving the sky dark and moonless for at least 2 and a half hours before the first light of dawn, providing a good backdrop for viewing this faithful meteor display. Editor's note: If you snap a great photo Lyrid meteor shower that you'd like to share for a possible story or image gallery, send photos, comments and your name and observing location to spacephotos@space.com. Joe Rao serves as an instructor and guest lecturer at New York's Hayden Planetarium. He writes about astronomy for Natural History magazine, the Farmer's Almanac and other publications, and he is also an on-camera meteorologist for Verizon Fios1 News based in Rye Brook, New York. Follow us @Spacedotcom, Facebook and Google+. Original article on Space.com.